Highly dilutable air freshener/Odor Control concentrate for use in a variety of applications: as a surface spray, mop water additive, carpet cleaning additive and more. Use 2-4 ounces per gallon of water and/or cleaning solutions. 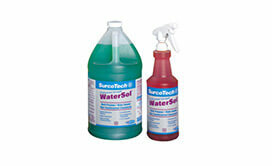 WaterSol™ Air Freshener/Odor Control Concentrate is highly effective against most indoor odors. Excellent for hospitality use. Packaging: Quarts (.946 l) packed 12 per case, Gallon Bottle (3.78 l), packed 4 per case, 5 Gallon Pail (18.92 l), 55 Gallon Drums (207.9 l).